Alison:Remember last week when I told you we were going to the State Fair? 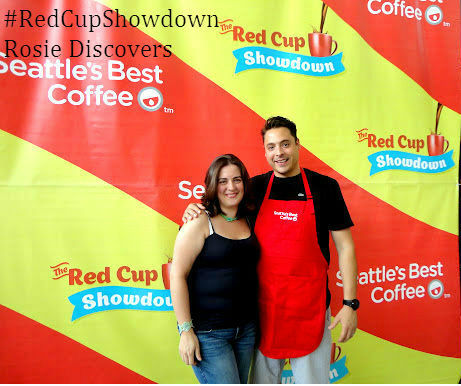 Well we did go Friday for the Seattle’s Best Coffee #RedCupShowdown. Susie:Duh, remember who drove the whole way? I think I know that we went. Alison:Yes, but they don’t know! Susie: You just told them that we went. Alison: *rolls eyes*It started quite early at 8:30 am and was two intense hours (for the competitors). 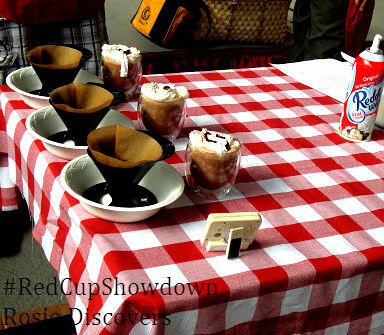 There were thirteen people competing at the fair for a $500 first prize which also included a trip for two to New York to compete in the final Red Cup Showdown. Susie:Hey! Don’t think I didn’t notice that eye roll just because you typed it instead of doing it! Alison: So, you do proof read the posts? At least you’re paying attention. While the audience didn’t get to sample the entries, I do have a special treat for you. 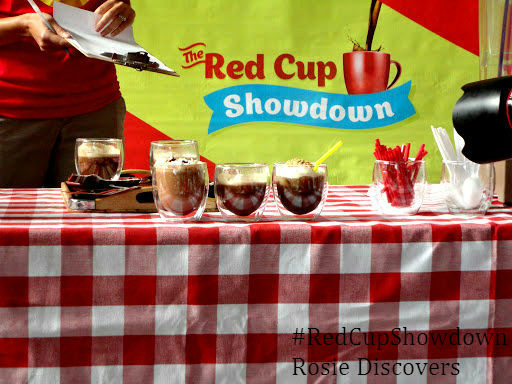 The three finalists all offered to share their recipes with me to share with my readers. 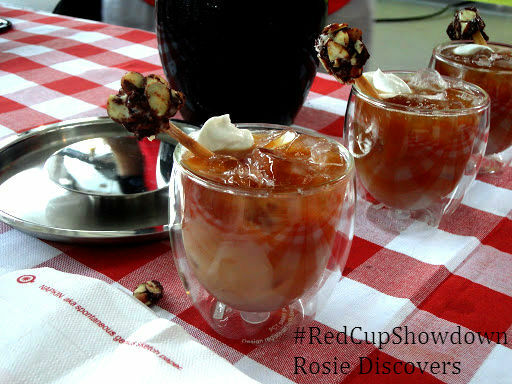 So now when you make these amazing drinks it will be almost like you were there with us at the competition. 1. Heat first seven ingredients in a saucepan on medium-low heat stirring until combined, then take off heat. 2. Add ground coffee to filter and add water to coffee maker and brew. 5. Take mug out of microwave and insert a wire whisk. 6. With the whisk in between your hands, roll the whisk back and forth until the desired froth is obtained. 7. Mix the chocolate mixture, coffee and frothed milk in equal parts. 8. Add whipped cream and chocolate sauce on top. 9. Dust with spices (chile powder and cinnamon). In a large container combine coffee and cold water. Stir well and cover container and let steep overnight (but no longer than 12 hours). 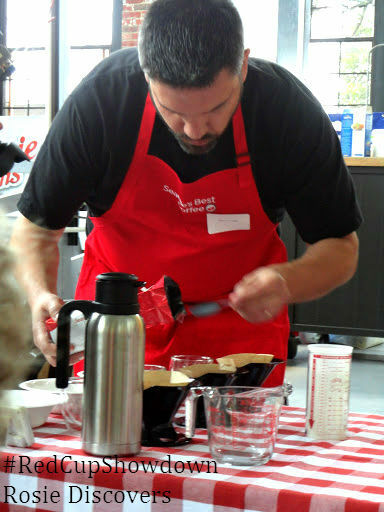 Strain using a strainer and cheesecloth to get the coffee filtered. Refrigerate. This gives you cold brewed coffee. You can use this to make coffee ice cubes, just pour into molds and freeze. In a shaker add; ice cubes (coffee ones preferrably), cream of coconut and both milks. Shake vigorously and pour into a glass. Fill the rest with coffee. 1 can (about 1/4 cup) Unsweetened Coconut Milk (Native Forest Organic) mixed with powdered sugar. Mix 14 ounces of shredded coconut with 15 ounces of corn syrup. Chill. When firm, roll into balls and press into melted Baker’s Chocolate (three ounces). Dip balls into slivered almonds and put in freezer. Throw ball on the end of a swizzle stick, such as a sugar cane. 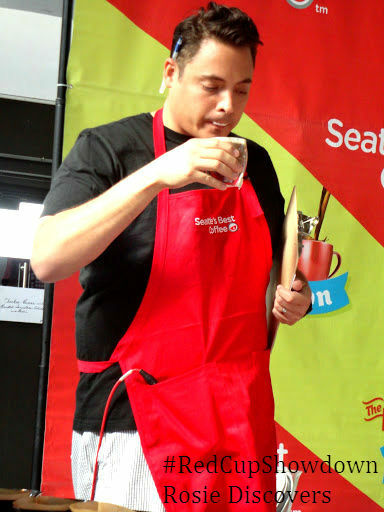 Brew 4 cups water with one coffee scoop of Seattle’s Best Coffee #3. After coffee is brewed, freeze into ice cubes. In bottom of Melitta pot place two scoops of chocolate covered toffee pieces. In the filter place one scoop of Seattle’s Best Coffee #3. Pour boiling water over the coffee grounds and let drain into the carafe until 1 1/2 cups of coffee is reached. Add this to the mixture in the blender with 6 coffee ice cubes and blend again. Pour mixture from blender into three glasses, place a layer of the whipped cream on the top and add sprinkles of chocolate toffee pieces on top of the whipped cream. 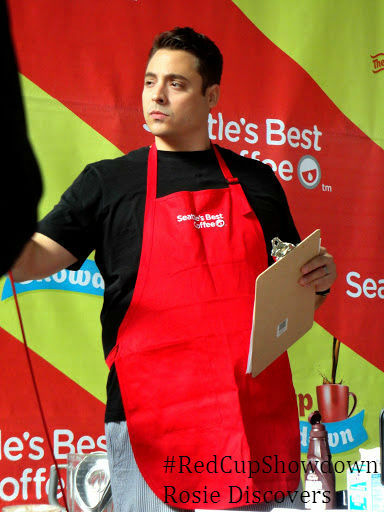 Alison: Jeff Mauro, who has a show on the Food Network and another starting this fall, was the host and one of the judges. 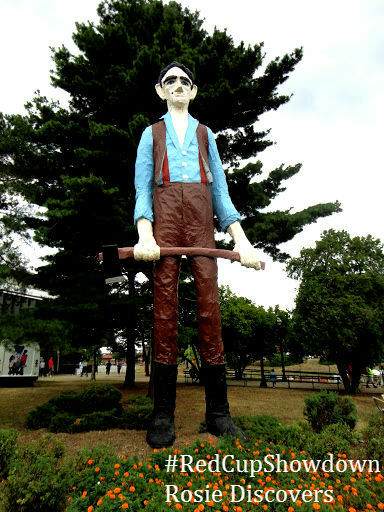 He’s originally from the Chicago area and it showed that he loved being at the Illinois State Fair. Susie: Let’s be honest, who wouldn’t enjoy the fair? An excuse to eat strange foods and make weird sound effects. Check and check. Alison: Sound effects? Are you certain we’re related? Susie: Hey, you’re the older one, I’m pretty sure you know I’m not adopted, but you can always ask Mom. Alison: I’ll pass. And we’re focusing…he was pretty entertaining too. He kept the crowd laughing and the competitors from getting too nervous. Susie:Anyone that can keep me laughing before I’ve had my coffee is in good in my book. 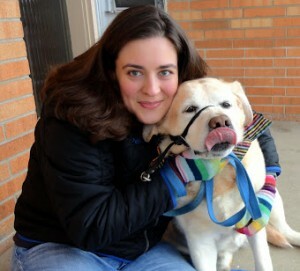 Alison: I also got to take a picture with him. 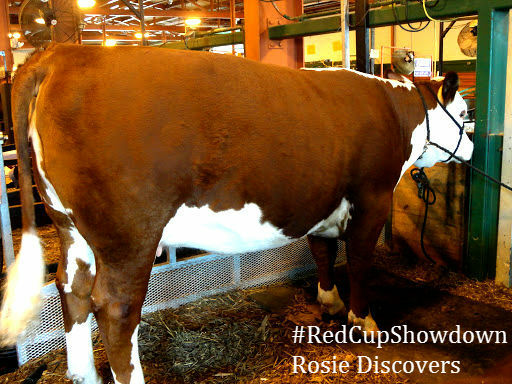 Alison:Besides being at the fair to see the Red Cup Showdown we also wanted to see some livestock and sample some amazing fair food. Susie: It was more like how far can we walk; you are just lucky I know how to read a map. 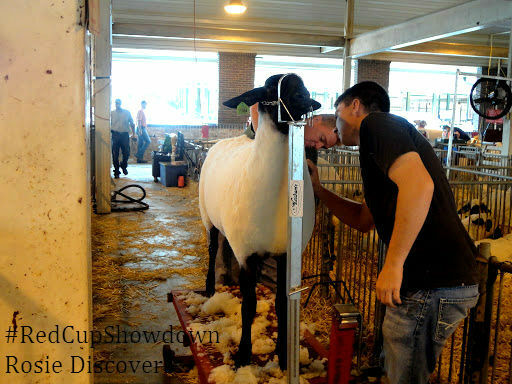 Alison:We saw a gorgeous sheep being sheared and groomed for showing. Love that it had a dark black face and such a snowy white coat. Susie: I keep telling you that it’s a Suffolk sheep. That breed naturally looks that way! 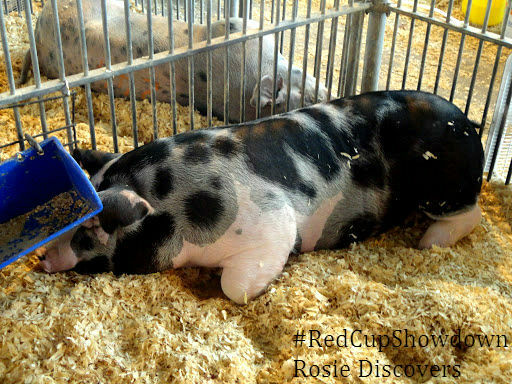 Alison:Then we found this perfect spotted pig. We actually watched it for a while and it actually moved closer and stuck its head under the feeding trough so we could get a better picture. Susie: I swear she wanted to take this pig home with us. Truly, if she could have gotten it into the car she would have smuggled it out. That’s how much love she has for this pig. Alison:Then off to see the cows. I’m always amazed at how huge they are. Susie: That’s normal! It’s like you’ve never seen animals before! Alison: This one was poised perfectly to get a photo. Love the brown and white markings. Susie: *sigh* I’m telling you it’s the breed! Hereford cows are brown and white! Alison: After all that it was time to sample some fair delicacies. 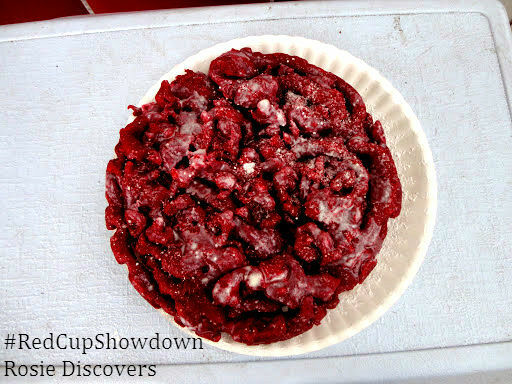 This is a red velvet funnel cake. Susie: Which I practically got dragged to, you say red velvet and she’ll do anything to get there. Alison: OMG it was soo good. Almost like a red velvet donut. Susie: See she doesn’t even know I’m talking about her, she’s imagining it all over again. Alison: There’s only one booth that sells these at the fair and it’s definitely worth seeking it out. I was told that the first day they actually sold entirely out of red velvet funnel cakes. 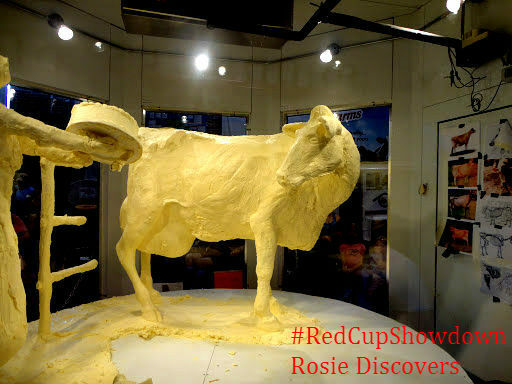 Alison:Next we stopped at the Dean’s Dairy building where they were carving this cow entirely out of butter. It’s not quite finished here in this picture, but the details are amazing. Susie: Shortcuts always lead to the best finds. We were all set to go around it, but we found a statue made of butter. 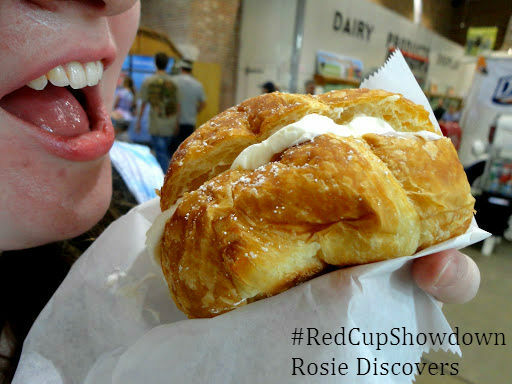 Alison:We did stop to sample a cream puff there and it was huge. The biggest I’ve ever seen. Susie: I think they can figure that out since you can tell it’s almost as big as my entire face. Alison:Also the tastiest. I’ve never tasted a better cream filling. It was so good I’ve already emailed Dean’s about maybe sharing their recipe. We’ll see if I get a reply. Susie: We can only hope. My cream puffs are good, but that was like rainbows dipped in clouds good. Alison: I’m going to just pretend I know what you’re talking about so we can move on. Susie: You weren’t exactly selling the awesomeness of the cream puff. I think now they’ll know how good it was. Alison:On the way out there was this really, really big statue of Lincoln which actually looked like it was made of papier mache. Quite imposing. Susie: You think I could get away with building one of those in the backyard? Alison: No. On so many levels no. Susie: You just don’t understand my need for artistic creativity. Plus that would take care of our crow problem. 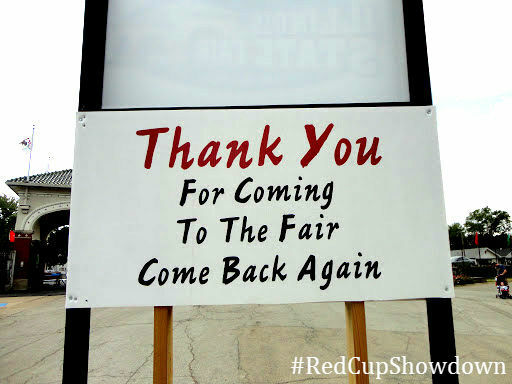 Alison: The Seattle’s Best Red Cup Showdown is now off to the Iowa State fair. That’s the last stop on its tour with the final showdown taking place later this August in New York City!! You can find all the details on their facebook page and follow along on twitter.